Want a show car shine? Start by polishing. Polishing is an essential step in the detailing process. A polish, prewax cleanser, or swirl remover prepares the paint for wax by removing impurities and smoothing out imperfections. 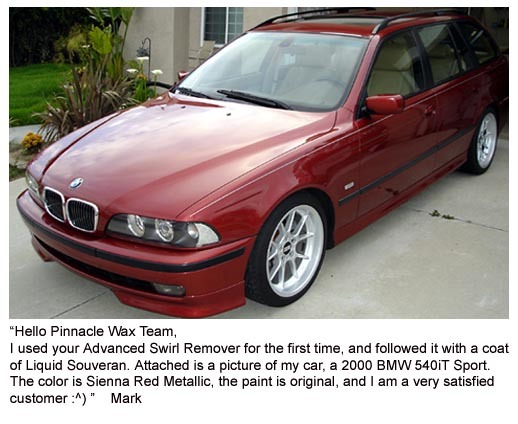 If your paint is smooth, polished, and clean, the wax will further enhance its beauty. After washing the vehicle, select a Pinnacle or XMT polish to remove old layers of wax, impurities, oxidation, and swirls. Swirl removers come in several levels of "cut" so you can tailor your polishing process to your vehicle's needs. Pre-assembled polishing kits give you the best value on Pinnacle and XMT polishes and tools. Pinnacle How-To Instructional DVD Updated! Pinnacle Liquid Gloss Rinseless Wash with Carnauba 32 oz.